We are about two weeks away from our big move to Texas. 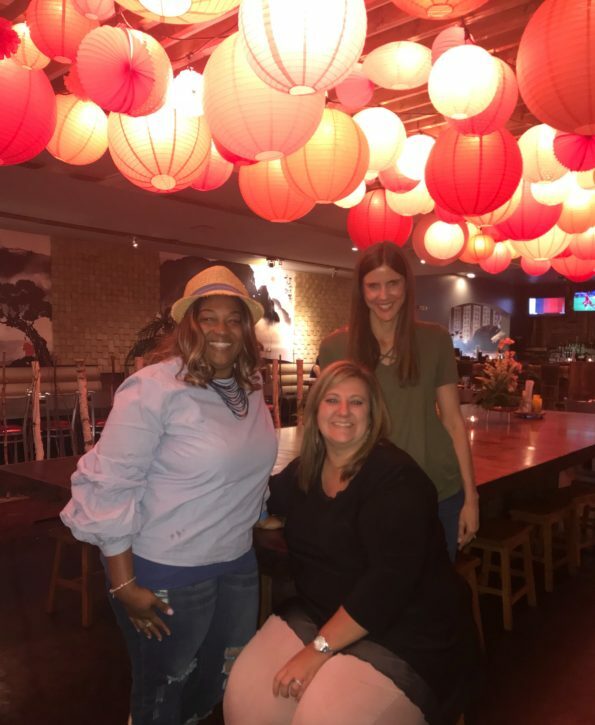 I have been making an effort to dine at all the new places that I have not been to yet in the Lafayette area. This past week my friends and I checked out the new restaurant, Sunny’s Rice & Noodles. Sunny’s Rice & Noodles is an Authentic Korean restaurant offering daily lunch and dinner specials, as well a very extensive Korean and Chinese menu. As we entered the restaurant it felt like we were whisk away to Seoul Korea. 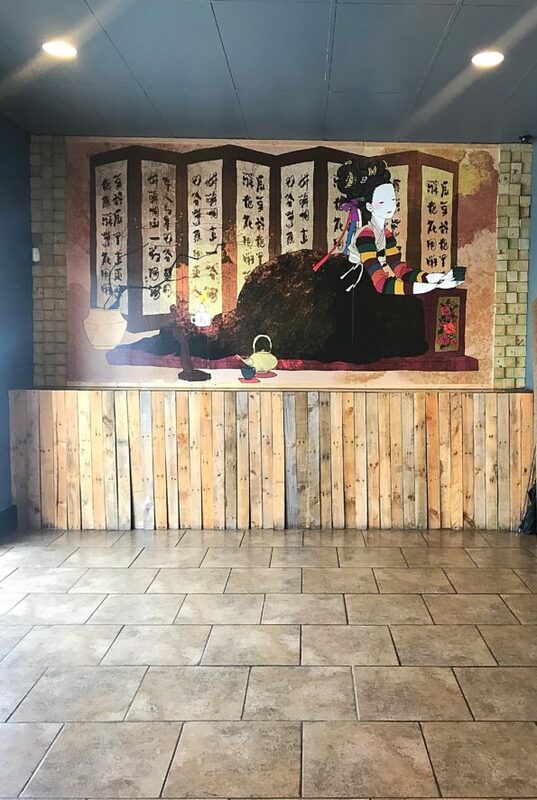 The decor fit right in with theme with a Korean restaurant. I loved the look of the restaurant. The middle section of the restaurant was my favorite! The table in the middle with the balloons overhead was very eye catching over the long table. Sunny’s offers a unique dining experience with a variety of seating options. It is a family style dining experience. We were seated near the back of the restaurant which gave us a great view of the entire restaurant. After being seated, my friends and I went right to chatting and catching up. Meanwhile the waitress came by and welcomed us to the restaurant and took our drink orders. I ordered a mocktail and it was delicious. 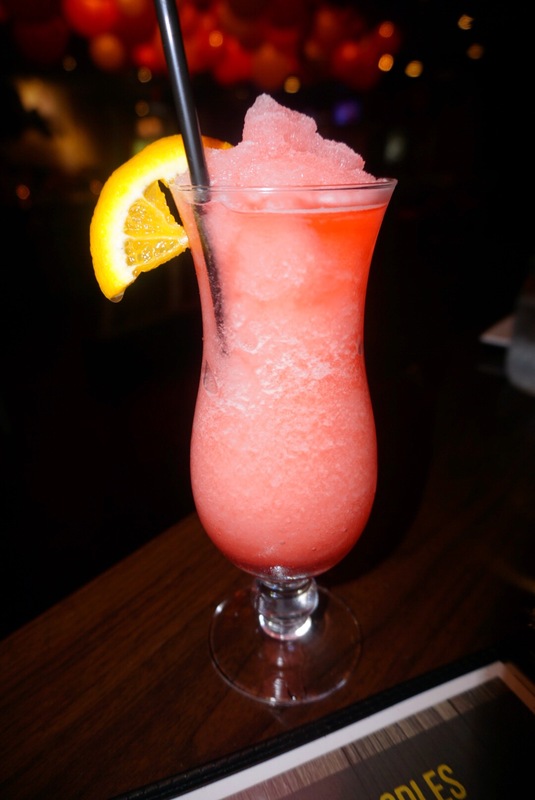 An icy, fruity, strawberry frozen mocktail. So good. The waitress made a few recommendations for appetizers. We decided to try her recommendations. The dumplings arrived at the table first. 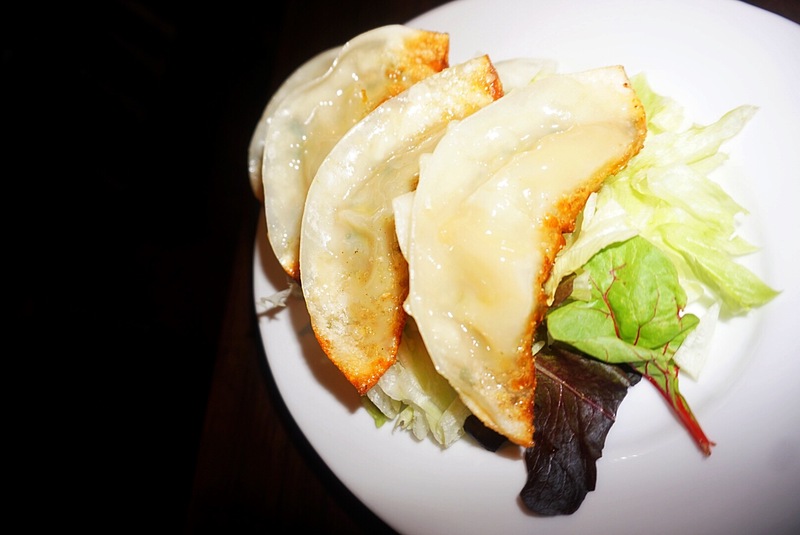 Seasoned pork dumplings, with a crispy exterior and flavorful. The dumplings were very good and paired nicely with the sweet and sour sauce or the soy sauce. My only complaint was that the dumplings were not fried golden brown on both sides which presentation wise, wasn’t acceptable. 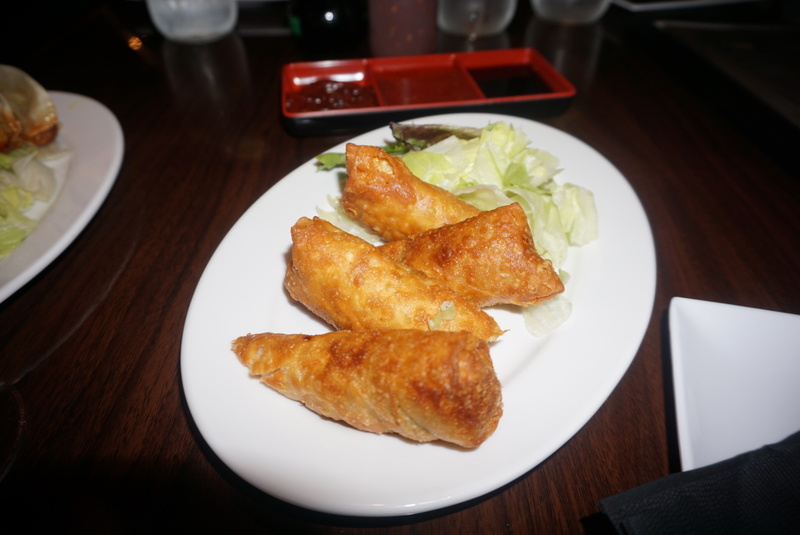 The next appetizer we tried was the fried egg rolls. The egg rolls were fried perfectly. A classic egg rolls but the rolls were good. We tried a few different sauces with each appetizer. The special sauce was so good! 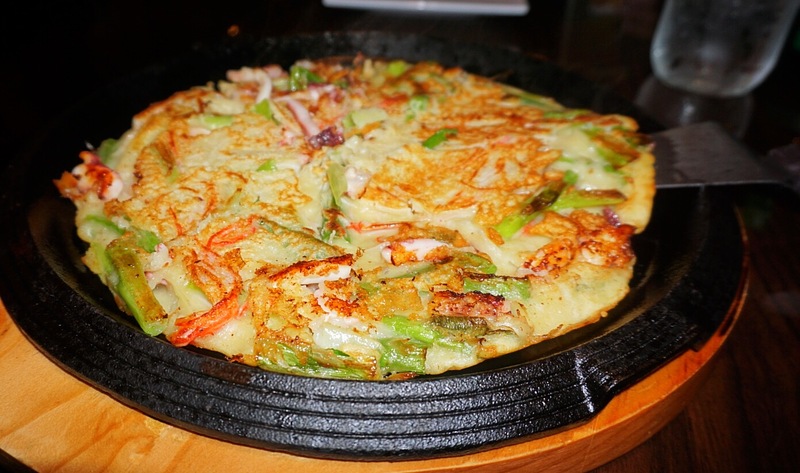 Our absolute favorite appetizer was the Korean Seafood Pancake, Haemul Pajeon. The Seafood Pancake included Scallions, Calamari and Shrimp. Ok stop the press, this pancake was amazing! Prepared perfectly! A light pancake with ingredients that complimented each other well. I love that they cut the pancake at the table. The presentation is spot on, served on a piping hot skillet on a wood tray! Amazing. A must try! Add some secret sauce on top you won’t be disappointed. After devouring each of these appetizers, we placed our entree orders. The menu had a variety of items that sounded so good. I contemplated whether I should try the Korean BBQ dining experience. But I decided to go with the next best thing. 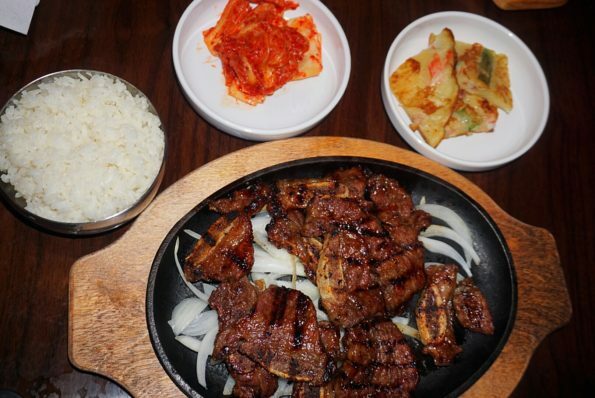 I ordered the LA Galbi, the Korean Short Ribs. Marinated beef short ribs with soy and garlic sauce. The short ribs were flavorful, tender and absolutely delicious. Served on a bed of onions but the onions were raw. I think the onions should have been cooked a bit. The dish would have been better if the onions were sautéed a little with a bit of the sauce of the short ribs. The dry rice was was different for me. It was a sticky rice which would have been fine with a little sauce or gravy. There was also kimichi. The kimichi was delicious. Very flavorful and the kimichi paired nicely with the short ribs. 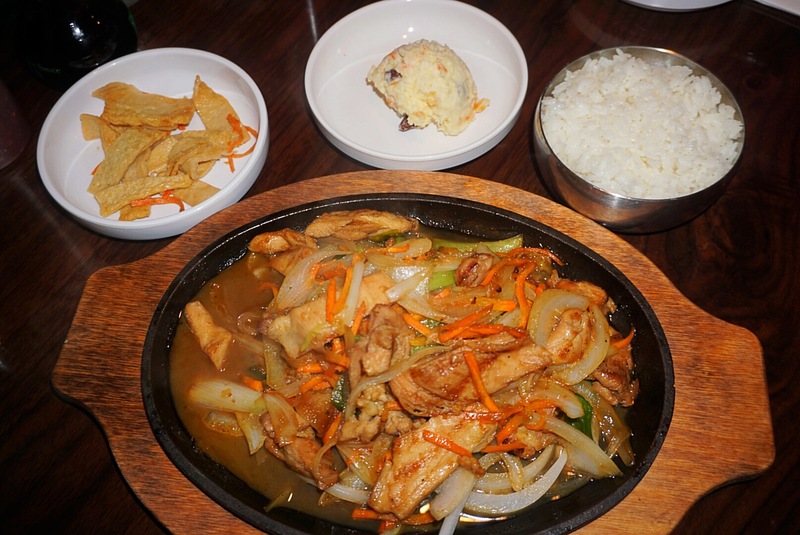 My friend Vicky tried the Chicken Bulgogi which included sliced, marinated chicken and onions in their signature sweet soy sauce. Served with rice, potato salad and kimchi. A pretty good dish. This dish was similar to a Chinese dish. 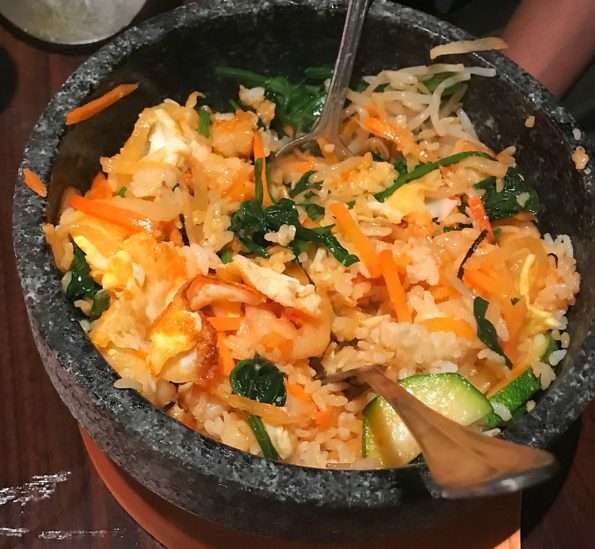 My friend Hillary tried the Dolsot Bibimbap! The best dish of the night! This dish includes your choice of meat, five different veggies, served in a hot stone bowl with a special spicy gochujang sauce. 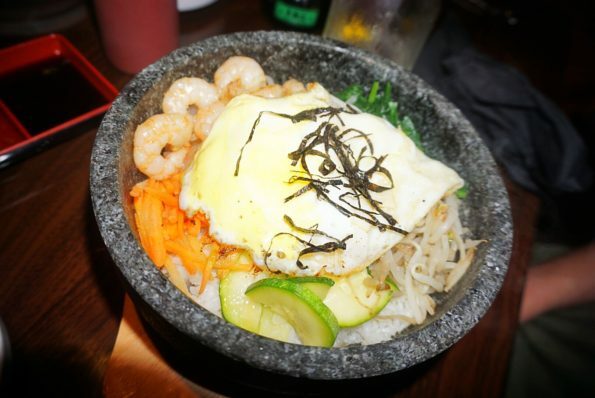 A dolsot bibimbap is a Korean rice dish that is served in a stove-hot stone bowl known as a dolsot. The bowl is gently heated on the stove or in the oven, before adding a heap of cooked short-grain rice, and the five different vegetable and the meat of choice. In this case, my friend chose Shrimp. I loved the presentation of the Dolsot Bibimbap. The waitress added the Korean red pepper paste on top and she began to mix the ingredients together. The smell of this dish was aromatic and made our mouths water. My friend gave me a few bites of the Bibimbap and the crispy rice was so good. Each bite was just as good as the next. I loved that the waitress mixed the dish for us, adding to the dining experience. Overall everything was really good. 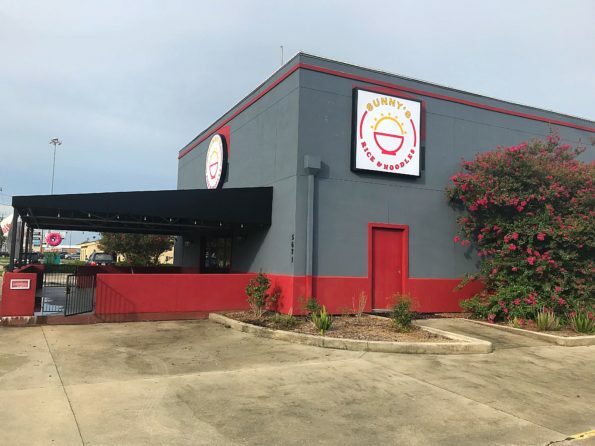 With exception of the few minor things I mentioned, the dining experience was the best I have had here in the Lafayette area in a long time. 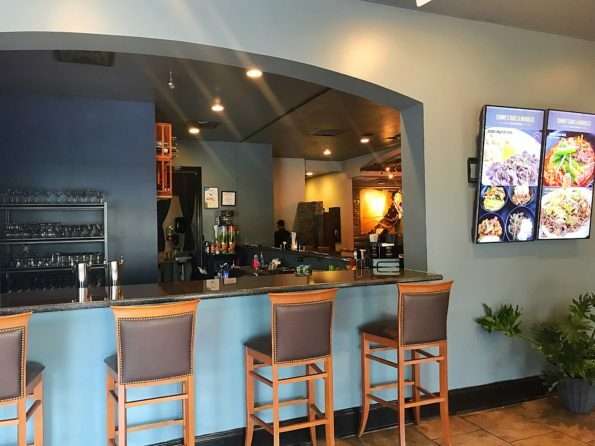 The service was spot on, our waitress was knowledgeable and she did an awesome job! The Korean dishes were delicious. If you get a chance to try the Korean dishes at Sunny’s I highly recommend them. 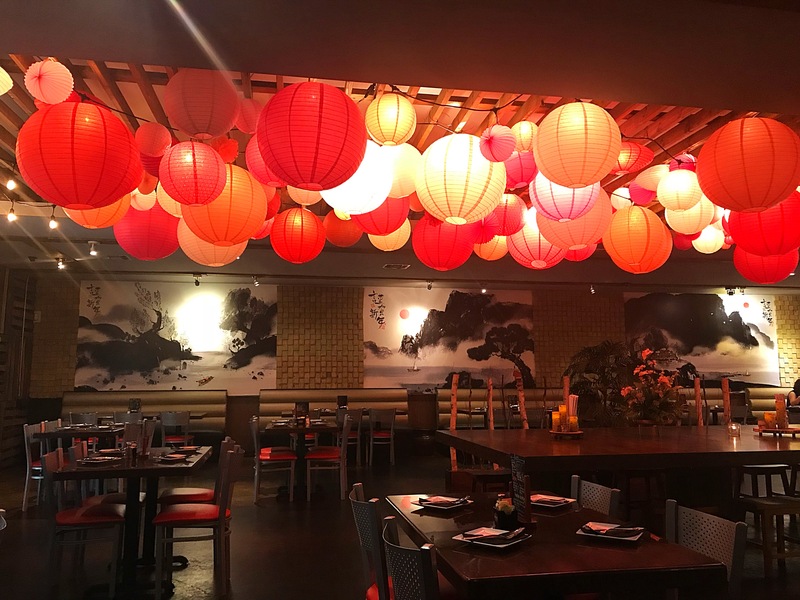 Must try dishes are the Seafood Pancake, Bibimbap bowls and the Short Ribs! 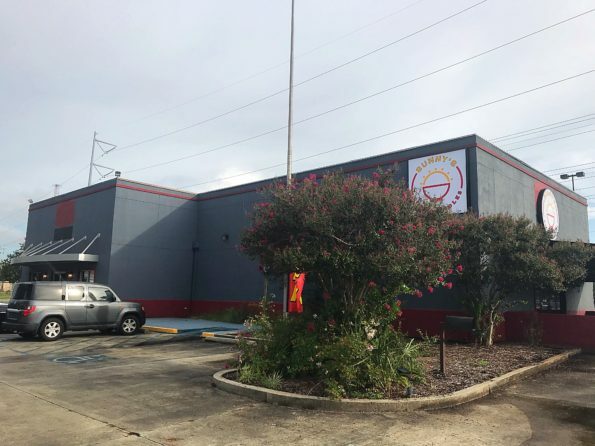 Sunny’s Rice and Noodles is located at 5621 Johnston Street, Lafayette, LA 70503. 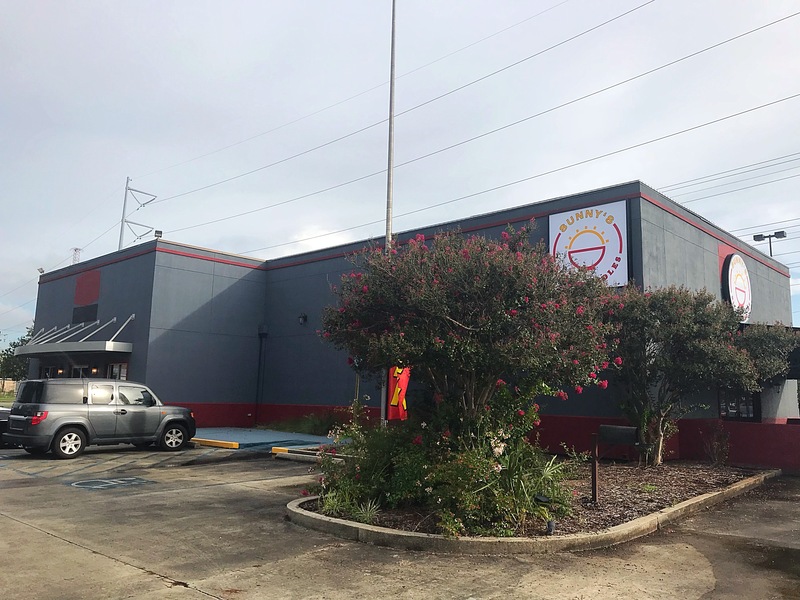 The Hours of Operation are Monday – Friday 11:00 a.m. – 2:30 p.m., 5:00 p.m. – 10:00 p.m. and Saturday 11:00 a.m. – 10:00 p.m. and Sunday 11:00 a.m. – 9:00 p.m.
Be sure to go and check out Sunny’s Rice and Noodles and tell them that Da’ Stylish Foodie sent you!